Why is this helpful? Let’s say there is an issue with one of your enterprise servers. Maybe your jobs are processing slower or you are wondering, "Why is my system so slow?" With Clarity, you can track back to the last 7 days and see what the data tells you. 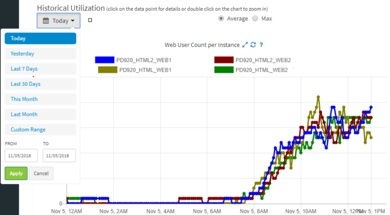 For example, this line graph shows us that server memory for two production application servers has been running high for more than half the week. 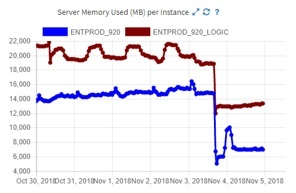 Moving into the weekend, when a full restart of the EnterpriseOne system occurred, memory dropped quite a bit for both applications servers. 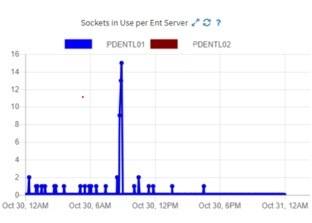 In the next graph you can see that on October 30, between 6 a.m. and noon, up to 16 server sockets were in use. We like to keep this number low, so it could mean there is a problem. But if you weren’t sure what these metrics were showing, you could click the “?” symbol to get a short description. Say we are looking at the “Sockets in Use per Ent Server” example again. We know we have an abnormal number of sockets in use. 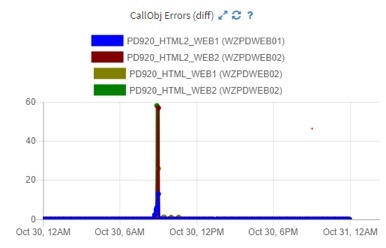 If we look at Call Object Errors on that same day, we see there was also a very high number or errors at the same time. Historical Utilization data helps us easily narrow down when an event occurred and it points to where we need to go to resolve the issue. We then use Clarity’s log parser to track down logs in that exact timeframe. If we do not already have an alert set up for the issue, we can add a custom alert here. The next time it occurs, Clarity will notify us. In our next blog, we will explore how Clarity's latest feature helps strengthen JDE security. 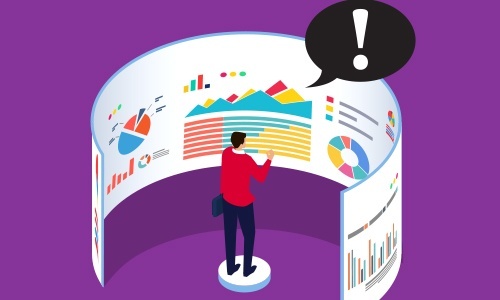 Click here to learn more about using ERP Suites Clarity. New to Clarity and want to see more? Contact us to see a demo. Miranda Cluxton began her career as a co-op with ERP Suites nearly ten years ago and quickly rose to a leading CNC. She is a Clarity product champion using data analysis to inform better decision making around user performance and security. Her insights into the customer experience continue to shape our products and processes. Frank Jordan is a CNC technology consultant with over 300 customer engagements. His work with JD Edwards Orchestrator Studio earned ERP Suites three Distinguished Partner Awards for digital innovation at INFOCUS 18. Frank is the co-author of Advanced Tuning for JD Edwards EnterpriseOne Implementations and a frequent conference presenter. Why do a business process review? SAP Finance: What do GL account fields do?